Head of Sustainability CDB Aroshi Ranatunga holds the award presented to CDB on being adjudged among the Best Ten Integrated Reports at the CMA Excellence in Integrated Reporting Awards with Speaker Hon. Karu Jayasuriya as Chief Guest. President CMA Sri Lanka Prof. Lakshman R Watawala is at extreme left. 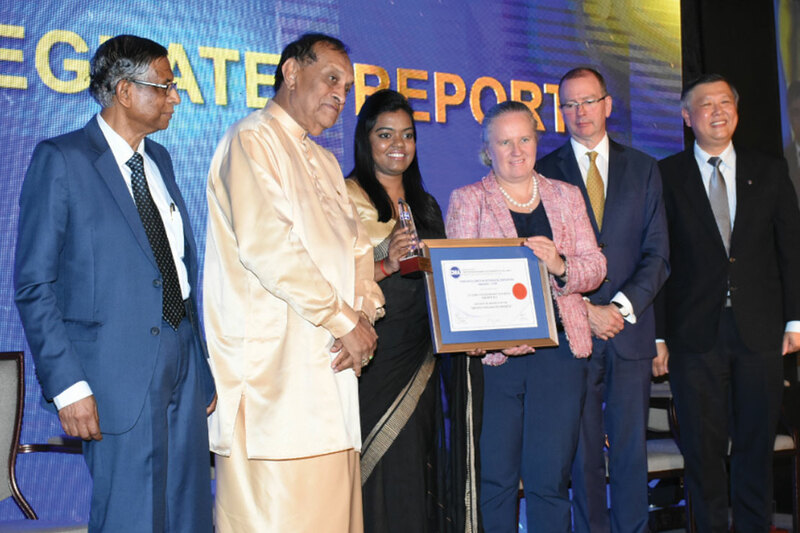 Making waves in corporate annals yet again, Citizens Development Business Finance PLC (CDB) was placed among the Best Ten Integrated Reports at a gala ceremony organised by the Certified Management Accountants (CMA) of Sri Lanka. The CDB integrated report gained kudos at the CMA Excellence in Integrated Reporting Awards recognising the report’s emphasis on the importance of embedding integrated thought processes into business practice. Under the aegis of Speaker of the Parliament of Sri Lanka Hon. Karu Jayasuriya, the awards, held for the fourth consecutive year encourages both listed and unlisted Sri Lankan companies as well as public sector entities to undertake integrated reporting as part of their reporting process to ensure further transparency and accountability and better interaction with investors and stakeholders. Working on the guidelines of International Integrated Reporting Council’s (IR) Framework, the CMA Excellence in Integrated Reporting Awards are evaluated on the Guiding Principles, Content Elements and Fundamental Concepts contained in IR Guidelines, encompassing strategic focus and future orientation, connectivity of information, value creation and reliability and completeness.